Paraiso Del Mar (PDM) is located on El Mogote peninsula which is a short boat ride from The Malecon. 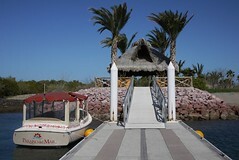 PDM operates a boat for owners and their guests. There is no fee for you to use the boat. The maritime operation hours are from 7:00 am to 10:30 pm. The boats run every 30 minutes. The dock area “La Paz Pier”, is located at Vista Coral Plaza in La Paz. From La Paz Pier to Paraiso Pier: 7:00 am, 7:30 am, 8:00 am, 8:30 am, … 10:00 pm, 10:30 pm. From Paraiso Pier to La Paz Pier: 7:15 am, 7:45 am, 8:15 am, 8:45 am, … 9:45 pm, 10:15 pm. You can always use a water taxi service after hours. We recommend Jose Antonio 612.108.6900 available all night. 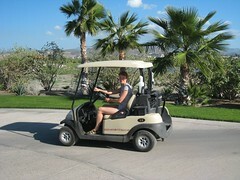 Paraiso Del Mar is working with Premier Rentals to provide golf carts for rent to owners. The minimum rental is one week. They have a selection of 2, 4, and 6 passenger carts. If you are interested in renting one during your stay, please email info@paraisodelmarhoa.com and let them know which model you need and your arrival and departure dates. They will get back to you with prices. If you don’t want to get yourself a cart, there is a free ground transportation on site. It is operating on a call-up/as needed basis from 7 am to 11 pm, daily.